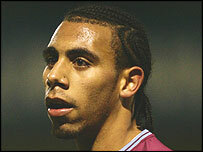 A man has told a court Premiership footballer Anton Ferdinand punched him outside a nightclub. Emile Walker claimed he was hit once by the West Ham player before being kicked and punched by up to 10 people outside Faces in Ilford, east London, in 2006. Mr Ferdinand, 22, denied charges of assault occasioning actual bodily harm and affray, at Snaresbrook Crown Court. His co-accused Edward Dawkins, 28, of Beckton, east London, also denies similar charges. Mr Ferdinand says he acted in self-defence, fearing he would be robbed of a £64,000 watch. Mr Walker told the court he managed to escape the group and out-run some of those who gave chase. Shortly afterwards a friend picked him up in his car and took him to hospital where a forehead wound was stitched, the court heard. Mr Walker denied he went to the nightclub knowing it was "a place where footballers" went who might be vulnerable to being robbed. Antony Chinn QC, counsel for Ferdinand, asked him to look at a watch he said the West Ham defender was wearing that night. Mr Chinn said: "It may not be to everybody's taste but I suggest it is a striking piece of jewellery with a diamond or two that might twinkle in the lights."